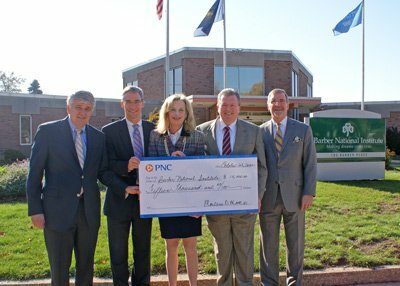 Thanks to a $15,000 donation from PNC Bank, more young children will have the opportunity to receive a quality early childhood education. PNC made the donation to the Barber National Institute through the Educational Improvement Tax Credit (EITC) program. “Investments in early childhood education are vital to the success of our children, yet thousands of children across our nation have limited access to preschool programs,” said Dr. Maureen Barber-Carey, executive vice president of the Barber National Institute. The EITC program offers businesses an opportunity to receive a direct reduction of their state tax amount when they choose to make a contribution to a participating program such as the Preschool Scholarship Program. The scholarships are given to qualifying families to help provide quality early childhood education for preschoolers.